EXCLUSIVE Send a unique and memorable birthday greeting from the heart that’s sure to touch theirs. 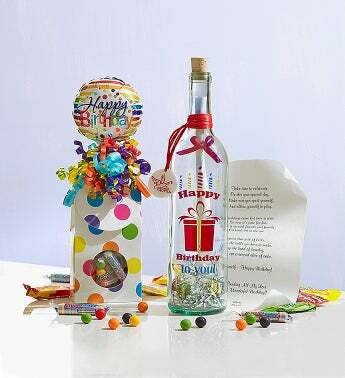 Our keepsake Message in a Bottle® arrives with your best birthday wishes printed on a scroll inside. It’s a touching gift to let someone know they’re on your mind, not only on their birthday but every day. To sweeten their surprise, we’ve included a delicious box of candy and a festive balloon! And allow yourself to play. Or bask out in the sun. Forget the calls you have to make. Instead, eat a second slice of cake. Enjoy yourself -- Happy Birthday! Send a birthday greeting from the heart! Our personalized Message in a Bottle® arrives with your best wishes printed on a scroll. Decorated with festive streamers and presents, this unique keepsake gift lets someone special know they’re on your mind, not only on this one day but every day.